This chapter discusses the Russian–Spanish commercial relationship in the 1720s under the Anglo-French Utrecht order as an alternative to a British–Russian alliance that had ultimately failed. 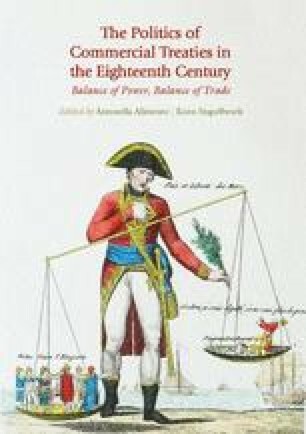 After the victory in the Northern War (1721) Peter I tried to strengthen Russia’s position in the European ‘balance of power’ including through ‘Westernizing’ the Russian economy, sending young aristocrats to study in Europe, having European economic texts analysed and attempting to conclude bilateral commercial treaties. While studying in London Ivan Shcherbatov translated John Law’s work on money and sent it to Peter I who wanted to invite Law to Russia. As Consul in Cadiz in 1724, Shcherbatov wrote ‘An Introduction to Russian Commerce’ and proposed a commercial treaty to Madrid. This period was a pre-history to Russia’s role in upsetting the European status quo through commercial treaties in the Age of Catherine II.